Delicious chocolate with a rosy tint – that’s what’s got every woman’s attention. 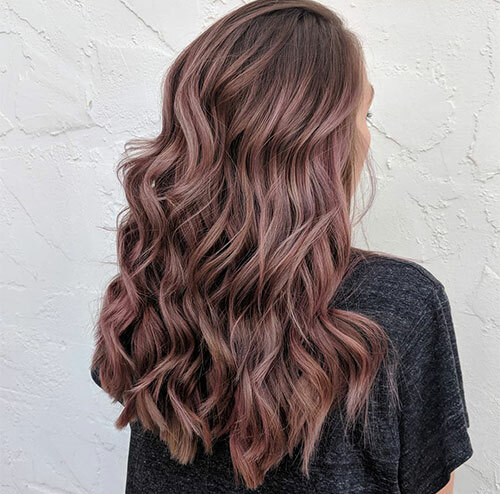 I’m talking about the rose brown hair color trend that’s been storming your Insta feed for months. 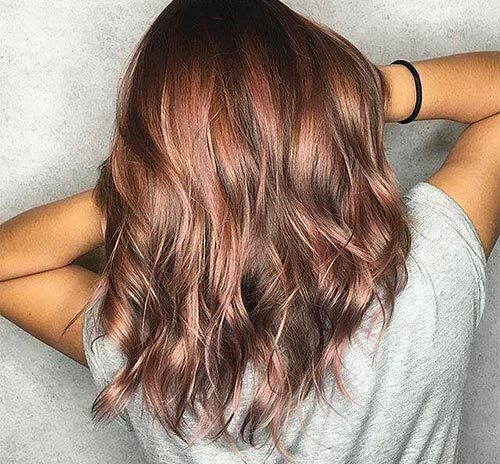 The rose gold trend has had us brunettes burning with envy for quite some time now. But now, rose brown has tipped the scales in our favor. What’s so great about this hair color that has the whole world awestruck? Well, not only does it suit all skin tones, but you can also find tons of shades that go with your personality. You also don’t have to bleach your hair for this color, which is a blessing! And, it looks GLAMOROUS as hell! Enticed? Great! 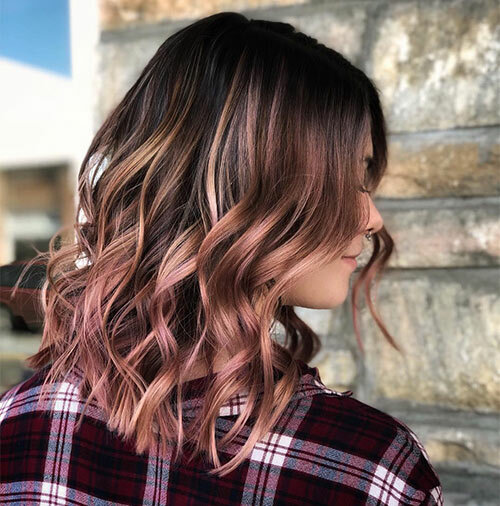 Let’s look at some tips you can follow to make the most of your rose brown hair coloring journey. Pick your shade of rose brown based on your skin tone. 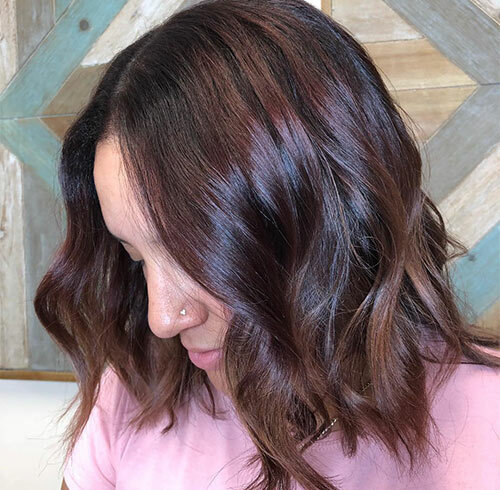 Rose brown is a versatile hair color and suits almost all skin tones, but the undertones play a key role here. Get a cool-toned shade if you have a cool undertone and a warm-toned hue if you have a warm undertone. You can go for any shade if you have a neutral undertone. Talk to your hairstylist. This is very important! Take time to discuss the exact color you want for your hair. 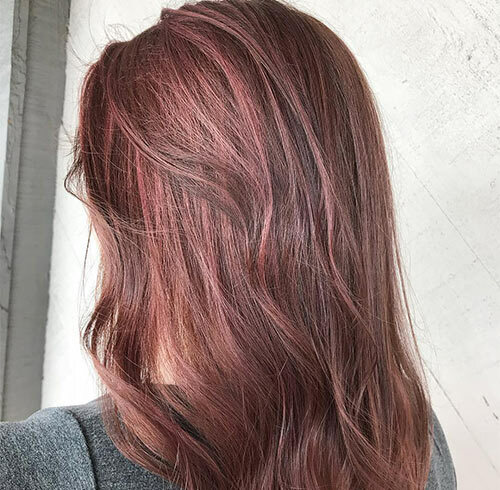 When it comes to rose brown, stylists can mix a bunch of colors to give you the exact hair color mix you want. It’s best to carry a reference picture to show them exactly what you want. Also, be open to their suggestions as they’re professionals and know what colors will and will not look good on you. If you’re dyeing your own hair, take the needed precautions to keep your hair and skin safe. Wear old clothes that you don’t mind getting stained. To protect your skin, apply petroleum jelly all along your hairline and around your ears. If you have really dark hair, you might have to lighten it a bit. Make sure your hair is healthy before you bleach it. If you do bleach your hair, make sure to oil your hair regularly to restore its health. Even coloring your hair rose brown requires daily care. Oiling your hair regularly will nourish it and leave it lush and glossy. Coloring your hair rose brown isn’t as damaging as you think it is. 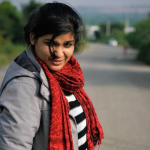 Just condition your hair regularly to maintain its health. 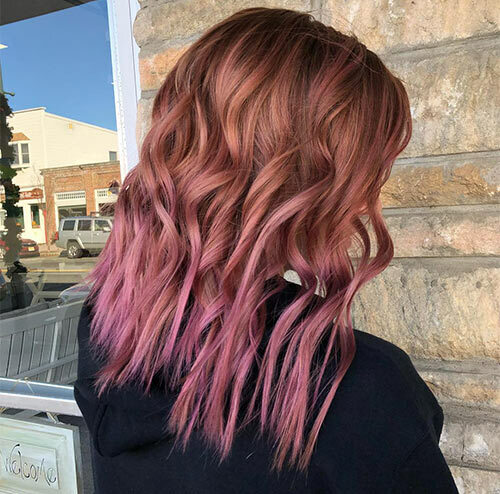 Check out these 35 surreal rose brown hair shades that are sure to inspire your next trip to the salon. This has to be the perfect mix of rose and chocolate. You can see the rosy hue and the lovely rich chocolate blend oh-so-beautifully. The waves that this hair look has been styled in raise its oomph factor to a million. Love! Not everyone loves drama unless it’s on their hair. This deep burgundy hue is so enticing that you can feel it hypnotizing you. I love how this rose shade blends with brunette hair seamlessly. It looks flawless. 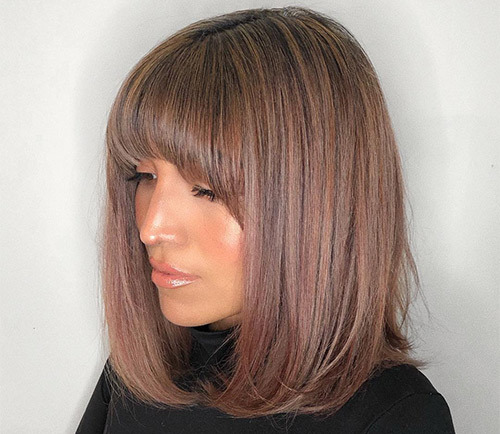 Mystery meets drama in this rose brown hair look. 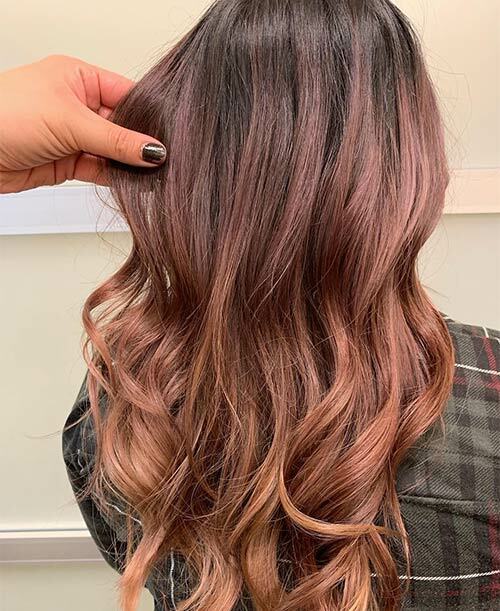 There’s something very intriguing about this cool-toned rose brown hair color that takes mystique to a whole new level. The purple rose flower was created by man. 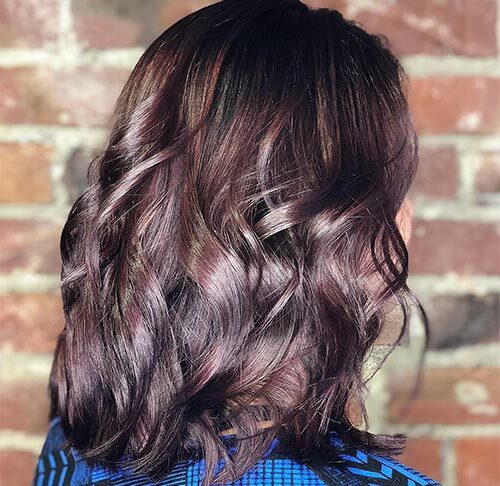 It symbolizes enchantment at the very first glance, which aptly describes this blend of purple and rose brown hair color. Isn’t it super enticing? By adding blonde to the mix, you can convert this generally cool-toned hue into a lovely warm-toned blend. 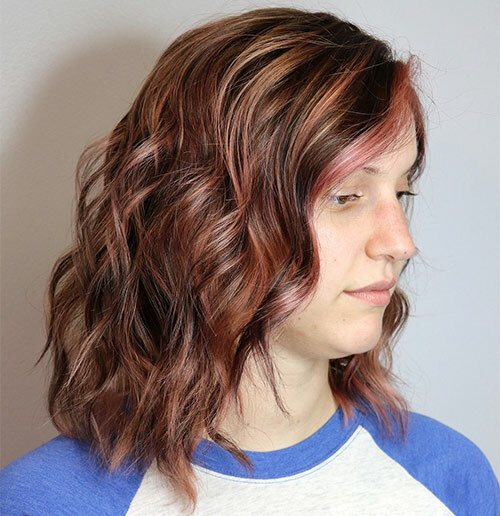 This rose brown hue is perfect for anyone with a warm undertone to sport during the winter. My friend got a brown-to-blonde ombre done a few months back and was recently complaining about how lifeless her hair looks now. 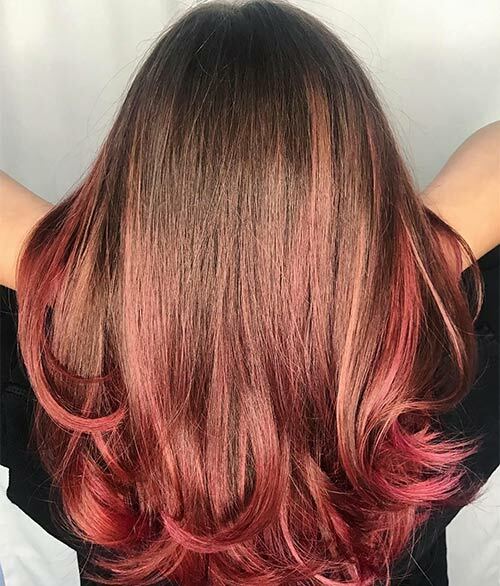 I suggested she spice up her hair with this stunning rose brown mix, and she loves it! Lavender or pink? Why not both? This blend of rose brown and lavender works well for all skin tones. I’m not kidding! Book an appointment with your hairstylist now. You won’t regret it! Start off small. 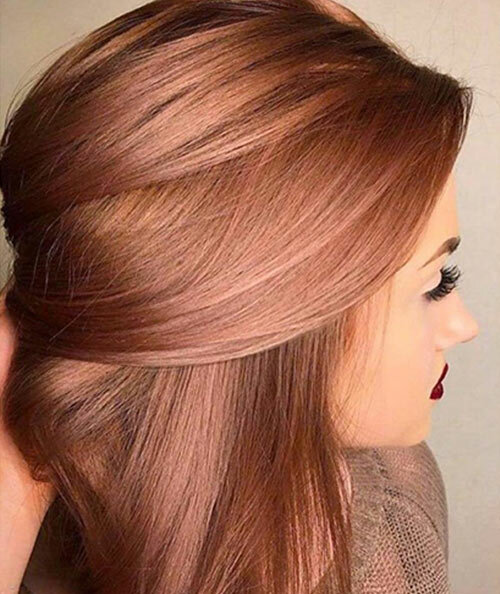 If you are not sure about this color, go for partial highlights to see if you like you like rose brown and if it matches your skin tone. You can also check if you want to go for a lighter or darker shade. Don’t panic if you forgot to buy toner. Sometimes, the yellow undertone that is left behind by hair color can be worked to your advantage. Since yellow is a warm color, it can lend a warm or neutral undertone to your rose brown hair shade. If you are looking for something subtle, I present to you this lovely shade of rose brown. You can see the reddish hue clearly standing out in those brown locks. It looks wonderful! Need to channel your inner princess? 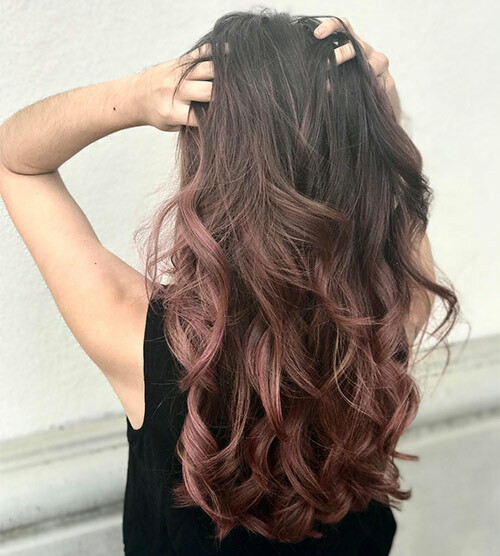 Opt for this suave pink rose brown hair shade. 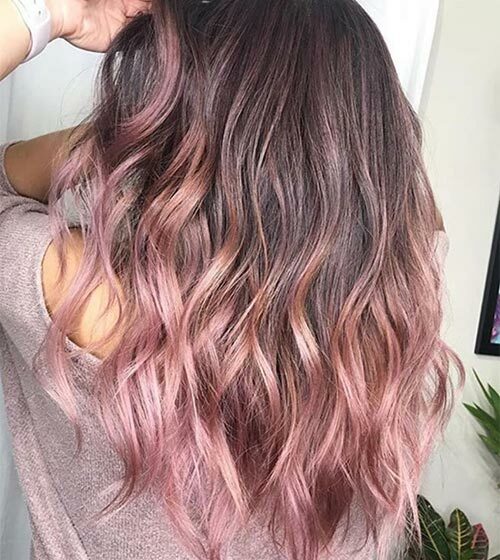 Light pink looks incredible when blended with brunette locks. This hair look makes me want to break out in song! 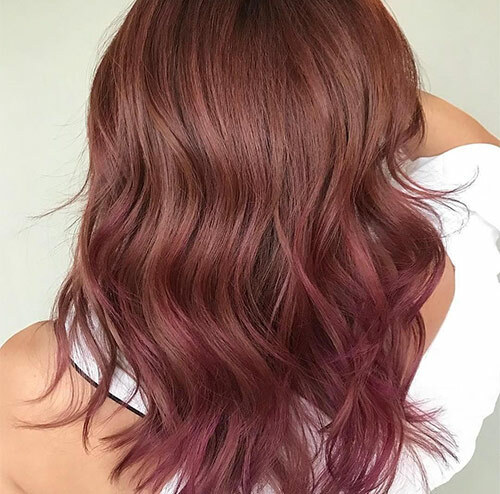 Wash your worries away with this wine rose brown hair color. It’s an extravagant color that is flawlessly intense. 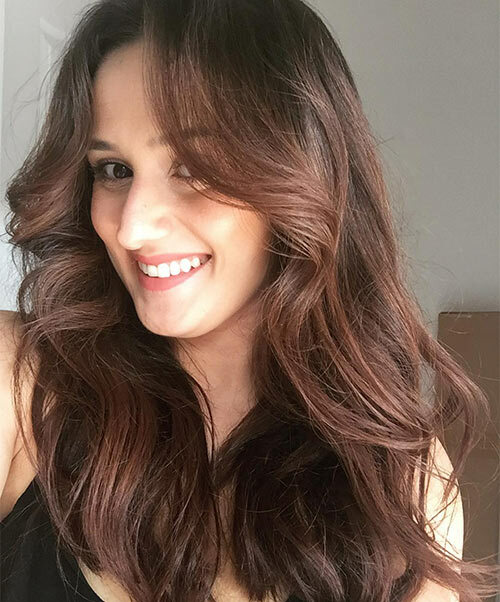 Style this hair color in waves to make your hair look voluminous and lush. 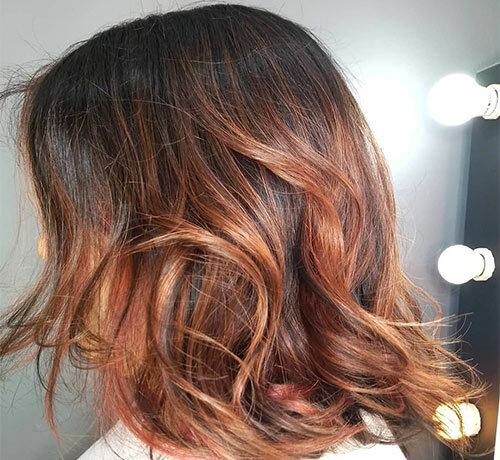 Ombre is one hair color trend that looks like it’s here to stay. So, of course, you need to try it out in a gorgeous rose brown shade. It adds tons of depth and dimension to your hair. In movies, when they’re trying to be dramatic, deeper hues are used to make things look sadder. Brighter hues, on the other hand, are used to depict happiness. Showcase your happiness with this superb bright rose brown shade. Auburn and brown are the perfect fall colors. They’re earthy and bring warmth to an otherwise cold season. Adding rose to the mix just makes this hair blend all the more enviable. If Cheryl Blossom ever sported Toni Topaz’s hair color (can you tell that I love Riverdale? ), this is probably what she’d go for. It’s a subtle reddish shade of rose brown. It’s lush, and it adds dimension and volume to your hair while making it look super shiny. Innumerable songs have been written about roses. Why? 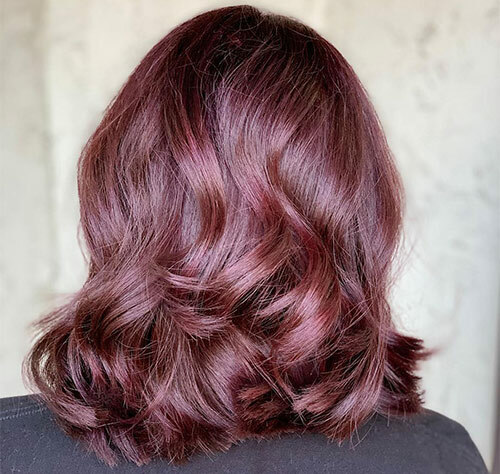 Because not only are they the symbol of love, but they also look downright perfect – just like this rose brown hair color mix. I present to all you blonde ladies this tastefully playful rose brown mix. Though it’s a girly shade, it can bring out anyone’s grungy side. I like how though this hair look is light, it still has a deep and intense vibe to it. 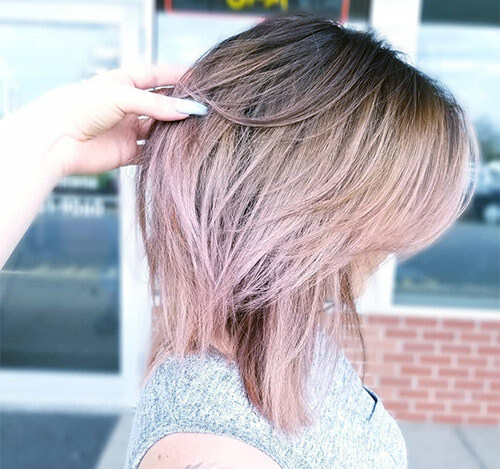 Sometimes, all you need is a dash of pink to spice up your locks. 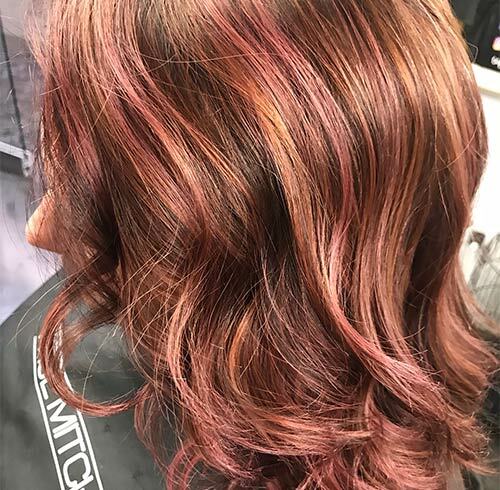 Take a look at this stunning rose brown color melt. It is warm-toned and soft. You can see the rose brown blend into a rose gold towards the end. 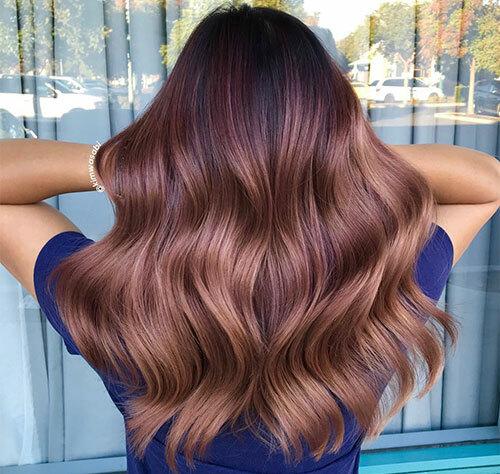 This hair color mix is perfect for fall. 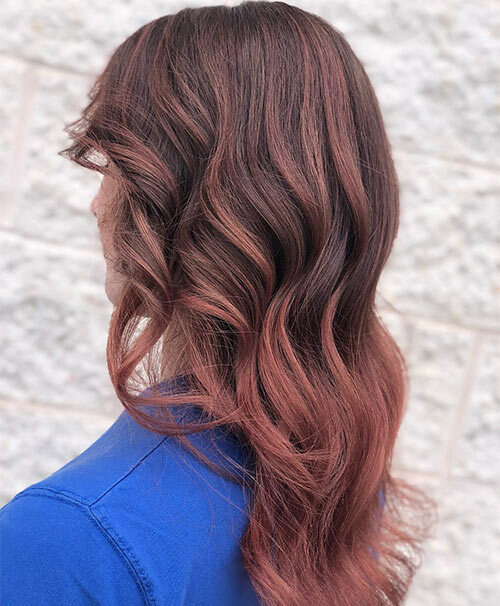 Rose brown and copper blend together to create this wonderful warm-hued hair look. It brings you warmth on cold and rainy days. I also like that the rose brown is more subdued in this look. It is a great example of how you can use it in little ways to spice up another hair color. 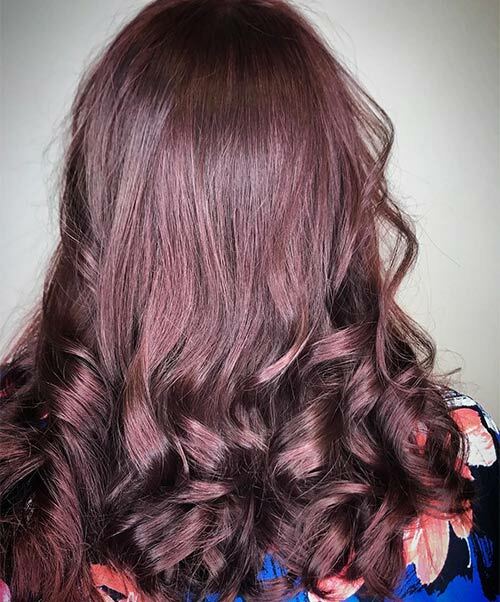 This rose brown hair blend runs as deep as your soul! I can almost feel the intensity bleed from the screen. If you have dark, medium, or olive-toned skin, you need to try out this color blend. It becomes lighter towards the middle and end, but still remains predominantly dark. This multi-shade blend adds dimension and texture to your locks. Women are naturally colorful beings. We love bright colors that speak to our personalities, much like this candy pop rose brown hue. Also, note how the contrast of straight hair at the top and wavy hair at the bottom brings dimension to this hairstyle. I also love the candy pop red hints that are peaking through. This is a vibrant way to beat the heat during those blasted hot summers. Pastels are THE color trend of the century! While most trends tend to die down over time, the pastel rage seems to keep picking up. 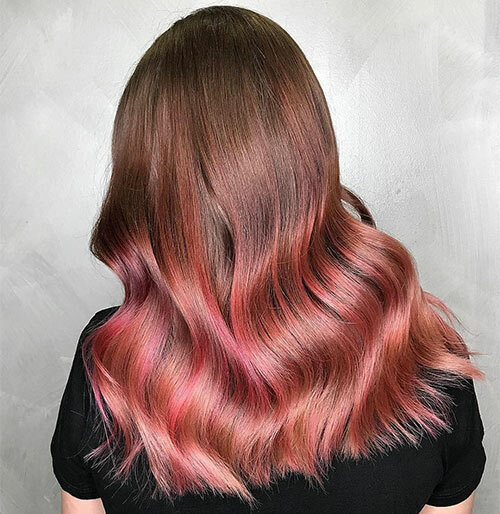 These subtle shades are so mesmerizing, you’ll want to try them in a heartbeat, just like this warm-toned pastel rose brown mix. You don’t always need to use dark colors to create an intense hair look. If you have medium brown hair, leave it be instead of making it lighter or darker. 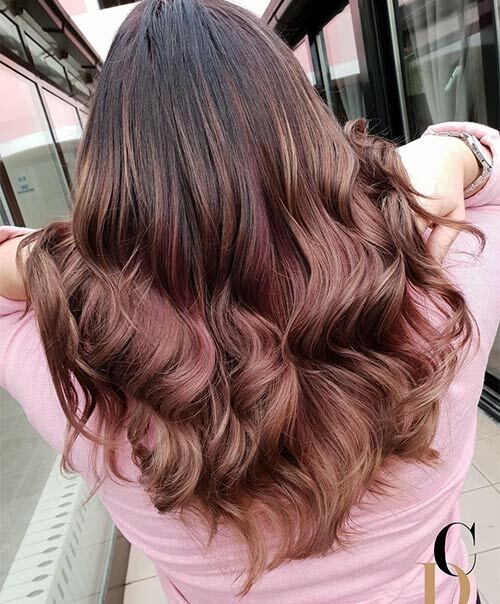 This way, when you color your tresses rose brown, you get a wonderful pink tint that is darker in a few areas and lighter in others. This gives your hair a dynamic look. You must be thinking that rose brown doesn’t fall under the vibrant category. Though you’re absolutely right, it is important to note that rose brown is one of the perfect shades to blend a vibrant color with. 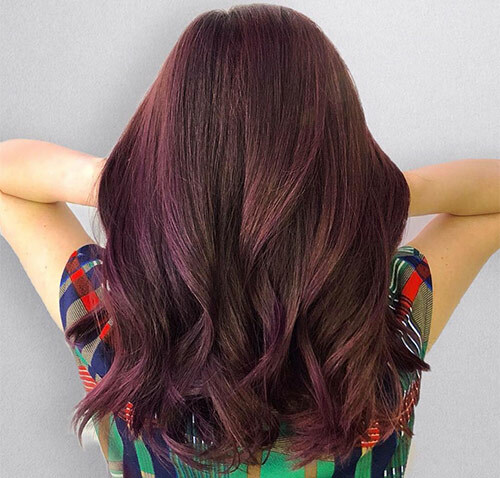 Look how well it blends with violet to bring you this exciting hair color mix. I’ve often heard that pink and purple are color pairs. They both are feminine shades that embody energy and grace. If bright colors are not your cup of tea, opt for smoky hair colors. Try this smoky lavender blend with a deep rose brown. It’s sure to leave everyone stunned. It is truly stunning what hairstylists can achieve. Take a step back and think about it. 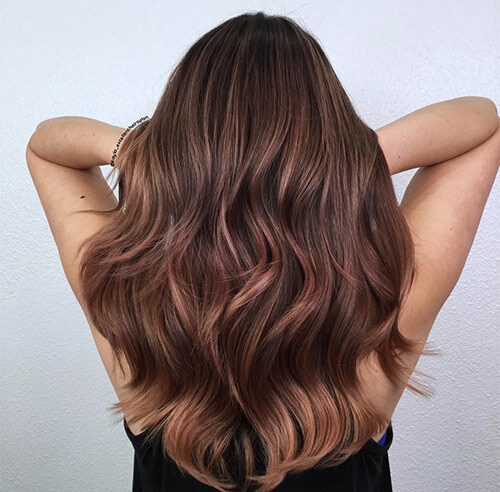 Not only can you get incredible hair colors like this rose brown balayage, but you can also volumize your hair by styling it wavy. Doesn’t it call for a round of applause? If you’re looking for a way to let your inner unicorn shine, this is it. Look no further. 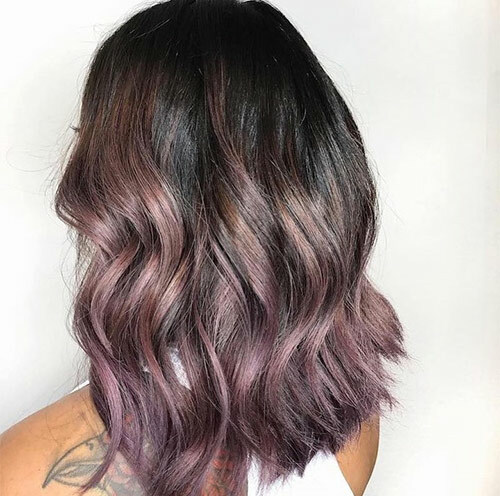 This gorgeous mix can be achieved by adding rose gold to your brown locks and bleeding it out with lilac at the ends. There’s a reason women love mahogany so much. The color is as intense and deep as your thoughts. Why not make it playful to match your personality? Add a nice rose brown hint to your mahogany locks to get this surreal blend. Perfect, right? If there’s one trend that will never fade, it’s denim. It’s no shocker that we’ve taken the denim feel to hair colors as well. It looks rad! When paired with wavy hair and choppy ends, you’ve got yourself a winning hairstyle. 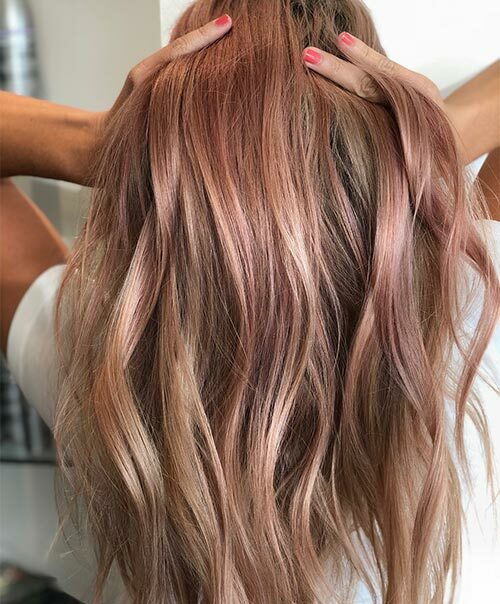 One of the most sought-after hair shades is rose gold. It inspired the rose brown trend. If you have a brown-blonde hair situation and feel that it lacks luster and life, try this hair mix! It will not let you down. 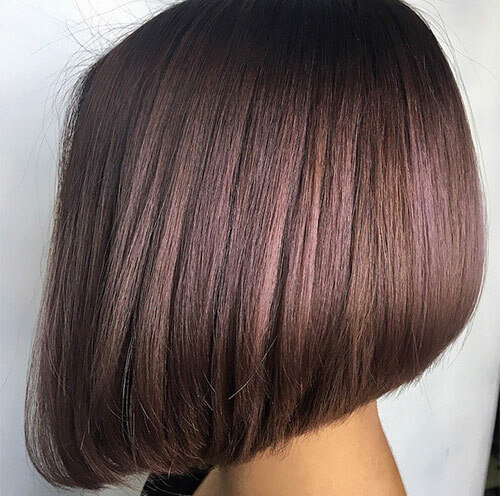 Metallic shades bring the gloss back to your locks. And, they look totally stunning. 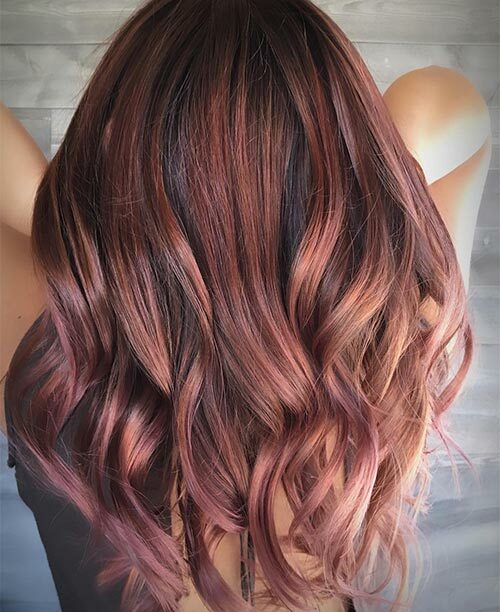 Try this metallic rose brown hue and restore the shine to your hair. A little bit of pop never hurt anyone. In fact, color pops are one of the highest-rated hair color trends of all time. 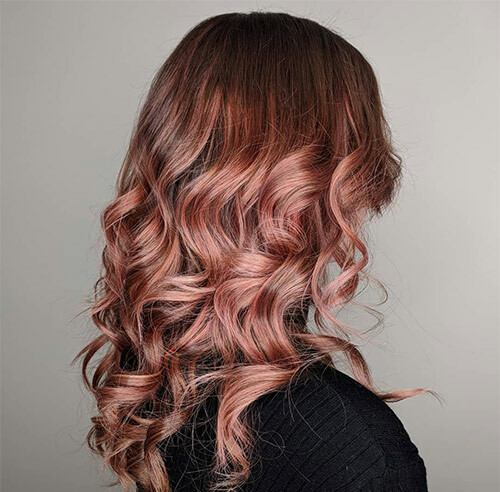 A pop of pink on rose brown hair is all you need to flaunt your locks and grab all the attention. Highlights are a great way to add a new lease of life to your hair. They also add dimension to your locks while framing your face. If you’re not sure about the highlights you’re getting, opt for partial highlights. This way, you can see how they look before committing to full highlights. 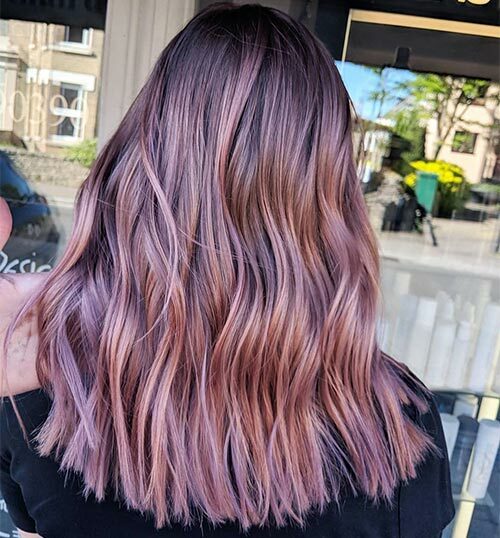 Rose gold on brown hair looks stunning. This color blend would look incredible during the winter and fall seasons because it is an earthy mix that is warm-toned. It’s neither too light, not too dark nor bright – it’s just perfect. Those were my top 35 picks of rose brown hair colors. 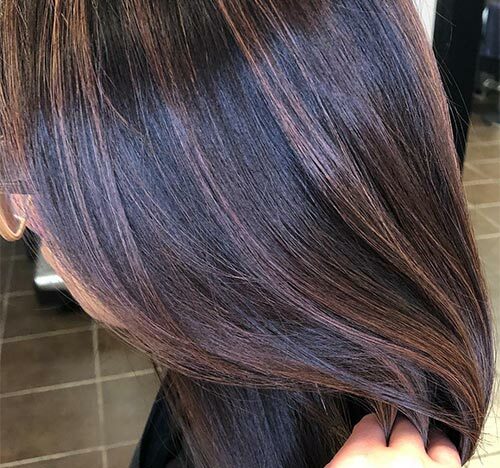 What I love about the rose brown hair shade is that we brunettes now have a special hair color! And, it’s a brilliant one at that. Which shade was your favorite? Comment below to let us know.